Microsoft finally announces on July 22nd, 2009 that Windows 7 and Windows Server 2008 R2 (both share same code base and designed to lock-step) have been released to manufacturing (RTM) milestone. In fact, the RTM of Windows 7 and Server 2008 R2 has been expected for quite some time, which is rumored to be on July 13th, 2009, although official time line stressed second half of July 2009. In fact, the official Windows 7 RTM build version 6.1.7600.16385 has been confirmed days earlier. With the RTM, it means that Windows 7 and Windows Server 2008 R2 development has finally wrapped up, the code is final, and will be released to OEM (original equipment manufacturers) and system builders within 48 hours (Windows 7 OEM availability on July 24 2009) to allow them some time to build the operating system into computers and other “smart” hardware so that these Windows 7 or Server 2008 R2 powered machine can be available in time for the Windows 7 and Windows Server 2008 R2 worldwide general launches. Windows 7 set to debut publicly on October 22nd, 2009 and Windows Server 2008 R2 will be generally available on or before that date, accourding to Microsoft’s press release. The whole release schedule of Windows 7 RTM to OEM, MSDN, TechNet, Action Packs and Microsoft partners has also been announced. According the the Windows 7 Team Blog, the RTM is build 7600, and was declared and signed off after all validation checks and significant RTM quality bar testing on a RTM contender were met. 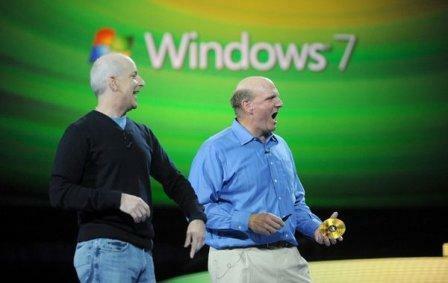 Microsoft released Windows 7 Beta at build 7000, and Windows 7 RC at build 7100. Steve Ballmer, Microsoft Chief Executive Officer also confirmed Windows 7 has finalized during Microsoft Global Exchange (MGX) in Atlanta, Georgia later in the day. Video showing Microsoft CEO Steve Ballmer on stage to announce the RTM of Windows 7 and Windows Server 2008 R2, and sign the gold RTM DVDs. Windows Server 2008 R2 and free standalone Hyper-V Server 2008 R2 have also been declared to RTM milestone by Windows Server Division Blog. Windows Server 2008 R2 and Hyper-V Server 2008 R2 release schedule is little faster but almost similar when compared with Windows 7, with an evaluation software available for download in the first half of August and the full product available to customers with Software Assurance in the second half of August. The Windows 7 and Windows Server 2008 R2 builds that are being RTM were compiled on Monday July 13, with full build version string of 6.1.7600.16385, also written as 7600.16385.090713-1255, as confirmed by Larry Osterman, a 20+ years Microsoft software design veteran engineer on his blog. The official RTM build is signed off on July 17, 2009 in a long process that only completed today. With the RTM of Windows 7 and Windows Server 2008 R2, it also officially marks the end of Windows 7 and Server 2008 R2 alpha, beta and release candidate phase. However, don’t expect Windows 7 development to stop, as future updates will come soon (probably sooner than most expected) in the form of hotfixes and service pack with rumor of Service Pack 1 (SP1) already emerging. While no official untouched and unmodified Windows 7 and Windows Server 2008 R2 DVD ISO images have been leaked yet, end-user self-made ISO images of Windows 7 RTM and home-made ISO of Windows Server 2008 R2 RTM have already available for download, which although may not stamp with official signature of Microsoft, but it’s based on original install.wim (the archive that stores all Windows 7 system files) extracted from original Windows 7 RTM DVD. Windows 7 RTM includes a version check that blocks upgrade path from pre-release version of Windows 7 (e.g. Windows 7 RC or Beta) to Windows 7 final RTM build. Use this hack to modify cversion.ini to allow in-place upgrade from prerelease version of Windows 7. Update: Original Windows 7 RTM ISO (x64 andd x86), original untouched Windows 7 RTM OEM ISO (32-bit and 64-bit) and Windows 7 E RTM ISO (32-bit and 64-bit) have leaked. Lastly, Engineering Windows 7 blog has published a video clip showing the final few minutes before RTM, where it’s a sign-off process where each and every team that contributed to Windows formally commits to having successfully executed the work necessary for the product to be in the release process. The video shows Windows 7 Team gather one last time (for Windows 7) in the “Ship Room” and a representative from each team signs (literally) and signifies their teams readiness for manufacturing. Read more information and FAQ about Windows 7 RTM.